What’s more exciting than racing? RC vs Supercars is a new segment that the guys from NitroRCX started. 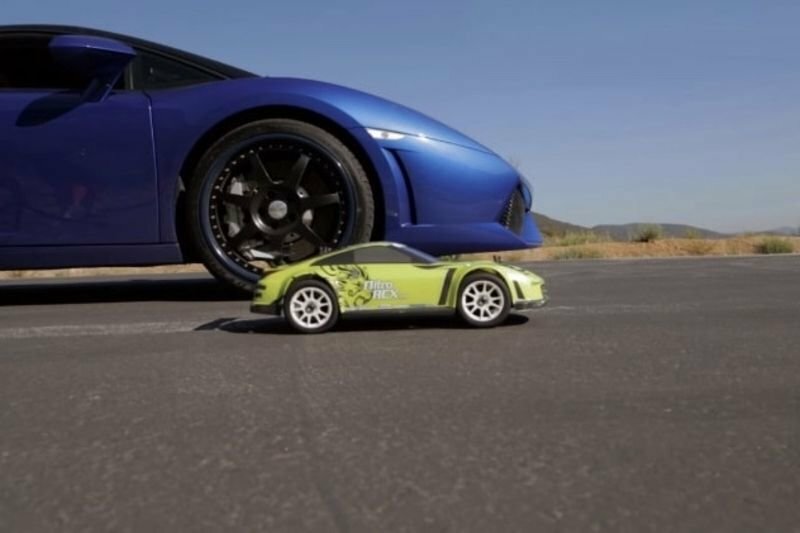 By releasing their 1/8 scale platform on road car Exceed RC has definitely raised the stakes. The results – that can be seen in the video below – was the tiny titan called MadDrift Brushless Drift Car. This little monster is ready to hit the streets right out of the box but is able also to flaunt with its distinctive look that will leave the competition buried in the dust. In this case, the victim that fell down was the raging bull Lamborghini Gallardo LP 550-2. So, the only reason that this tiny RC is so fast in this drag race is that it is light as a feather, together with its nitro boost and the fact that it is electric. With that in mind, this R/C car has way more power to weight ratio. Still, the guys from Nitro RCW stated that in the long haul the Lamborghini would have obviously won. Out of fairness for both cars, they did a 500feet run. Maybe a better launch control on the Gallardo would have been a photo finish in the race.